Missouri: at least one prisoner on a hunger strike at Leavenworth (USP). New York: strike activity at Coxsackie Correctional Facility, strike activity and boycotts at Eastern Correctional Facility. Ohio: at least one block engaged in a 3 day fast on first days of the strike and a commissary boycott throughout at Ohio State Penitentiary, plus a work stoppage in late July in response to preemptive repression by staff. Texas: More prisoners involved in the hunger strike at Michael Unit. With ongoing communication repression (including heightened censorship of mail, lockdowns, and constant searches and seizures of prisoner property), there is undoubtedly a great deal of information on strike activity that has not yet traveled outside. As organizers have said from the beginning of this process, there is a wall of silence around prisons in the US, which should itself be of great concern for the human rights of those held inside. Actions to further restrict and surveill contact with prisoners, such as Pennsylvania and Maryland’s “drug elimination efforts” which curtail access to reading materials under the false pretext of guard safety, would be a huge loss for the already extremely limited freedoms of US prisoners. Repression against strikers by prison authorities continues to be fought with phone zaps and letter-writing campaigns: reporting on these issues will directly prevent harm to inside organizers, particularly as coverage of the strike itself winds down. The next step for Jailhouse Lawyers Speak is the endorsement of a campaign to pressure politicians to enact legislative change; both JLS and IWOC will be taking stock of the strike with their members over the coming weeks to consider what other future actions will be necessary to build a movement strong enough to push for the rights of incarcerated peoples. For now, the most urgent tasks for anyone following the strike are to continue to push the demands inside and out, highlight ongoing or previously-unreported strike activity, and work to prevent or limit retaliation against strikers wherever possible. 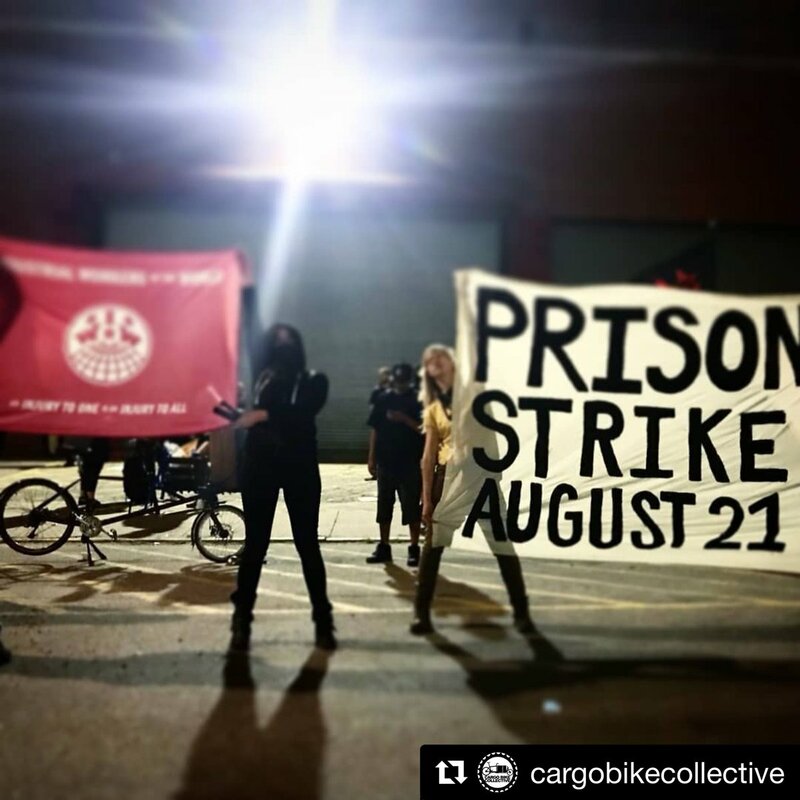 Incarcerated organizers never believed that their demands would be met a negotiating table during the past three weeks; it has been a huge success of the 2018 prison strike that the 10 points have been pushed into the national and international consciousness. The work of spreading and fighting for these demands will continue on all fronts until they are actualized, and then beyond that onto what JLS aptly calls “the dismantling process,” as we build a movement toward abolition. Jailhouse Lawyers Speak will be releasing an official statement from inside organizers this week. 1 Immediate improvements to the conditions of prisons and prison policies that recognize the humanity of imprisoned men and women. 2 An immediate end to prison slavery. All persons imprisoned in any place of detention under United States jurisdiction must be paid the prevailing wage in their state or territory for their labor. 3 The Prison Litigation Reform Act must be rescinded, allowing imprisoned humans a proper channel to address grievances and violations of their rights. 4 The Truth in Sentencing Act and the Sentencing Reform Act must be rescinded so that imprisoned humans have a possibility of rehabilitation and parole. No human shall be sentenced to Death by Incarceration or serve any sentence without the possibility of parole. 5 An immediate end to the racial overcharging, over-sentencing, and parole denials of Black and brown humans. Black humans shall no longer be denied parole because the victim of the crime was white, which is a particular problem in southern states. 6 An immediate end to racist gang enhancement laws targeting Black and brown humans. 7 No imprisoned human shall be denied access to rehabilitation programs at their place of detention because of their label as a violent offender. 8 State prisons must be funded specifically to offer more rehabilitation services. 9 Pell grants must be reinstated in all US states and territories. 10 The voting rights of all confined citizens serving prison sentences, pretrial detainees, and so-called “ex-felons” must be counted. Representation is demanded. All voices count! Wabash Valley Correctional Institution, prisoners in a segregation unit initiated a hunger strike on Monday August 27, demanding adequate food and an end to cold temperatures in the unit. Jessup Correctional Institution - small group engaged in work stoppage reported by JLS and another independent source. Leavenworth (USP) has at least one prisoner on a hunger strike. Lea County Correctional Facility in Hobbs, NM. On August 9, prisoners organized a work stoppage against conditions at the prison, operated by private corporation GEO Group. Tensions at the prison reached a tipping point prior to the date of the strike and prisoners could not wait before initiating their protest. All facilities in New Mexico were placed on lockdown status on the morning of August 20. This statewide lockdown has since been lifted except for Lea County C.F.. Prisoners at Hyde Correctional Institution in Swanquarter, NC demonstrated in solidarity with the strike. At least one prisoner has been retaliated against at Polk Correctional Institution for alleged strike activity. Ohio State Penitentiary (supermax in Youngstown) - at least one block engaged in a 3 day fast on first days of the strike and a commissary boycott throughout. Also there was a brief work stoppage in late July in response to preemptive repression by staff. Toledo Correctional Institution - At least two prisoners began a hunger strike on August 21. David Easley and James Ward were moved into isolation for participating and authorities have cut off their means of communication to outside contacts. IWOC was forwarded a message dated 8/23 from inside administrative segregation, (solitary) of a Texas gulf prison confirming that 2 people are on hunger strike in solidarity with the national action: "I feel great. But very hungry! And not because I don't have food but because of our 48 hours solidarity with our brothers and sisters. It's the only way we can show support from inside of Seg. Let everyone know we got their backs." IWOC has confirmed that Robert Uvalle is on hunger strike in solitary at Michael Unit, Anderson County, TX in solidarity with the nationwide strike. Robert has been in solitary for most of his 25 years inside. IWOC has subsequently confirmed that more prisoners are involved in the hunger strike. IWOC has confirmed that there is a work stoppage at the McConnell Unit in Texas. Northwest Detention Center - Representatives of over 200 immigrant detainees at Northwest Detention Center in Tacoma, Washington declared a hunger strike on day one of the national prison strike. Amid fears of retaliation, 70 across three blocks participated. As of this time, seven continue to refuse food into a second week. Burnside County Jail in Halifax prisoners went on strike and issued a protest statement in solidarity with the strike and naming local demands. They went through a lockdown and extensive negotiations with authorities; those who refused to cooperate with humiliating body scans were punished by being locked in a dry cell (no water or working toilets) for three days. Repression against strikers by prison authorities continues to be fought with phone zaps and letter-writing campaigns: reporting on these issues will directly prevent harm to inside organizers, particularly as coverage of the strike itself winds down.